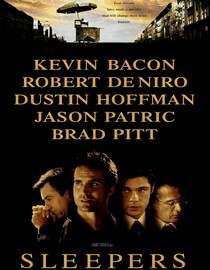 Featuring: Kevin Bacon, Robert DeNiro, Dustin Hoffman, Jason Patric, Brad Pitt. Director: Barry Levinson. This is a movie I'm surprised I'd never seen before. With a cast featuring Kevin Bacon, Brad Pitt, Dustin Hoffman and Robert DeNiro I'm not sure how this ever slipped through the cracks. Sleepers is a revenge movie with a pretty predictable plot that contains enough confronting content and good acting to make it work. I was expecting it to be more of a mob movie (mostly because of the cover) but while it had that sort of mob movie setting/feel it was more about these 4 boys who have bad things happen to them in a reformatory and what it does to them as boys/men. It was a good movie if you've never seen it, give it a look. Why is it in your queue? The ensemble cast of talented actors. Is it artsy? Nope, just a good ol' fashioned revenge flick. Best thing about the movie? Kevin Bacon being evil. What mood should I be in to watch this movie? Looking for a serious drama. Ummm why have I not found this blog earlier. It is great. I love the idea. I stream movies all the time - No TV really I just watch movies. This blog is great! I am trying to follow but my computer is being gay. Ill be back !! !